Paradise Point Estates in Hawaii is a five-star seaside island retreat. In the property is a luxury villa with breathtaking views offering utmost privacy. 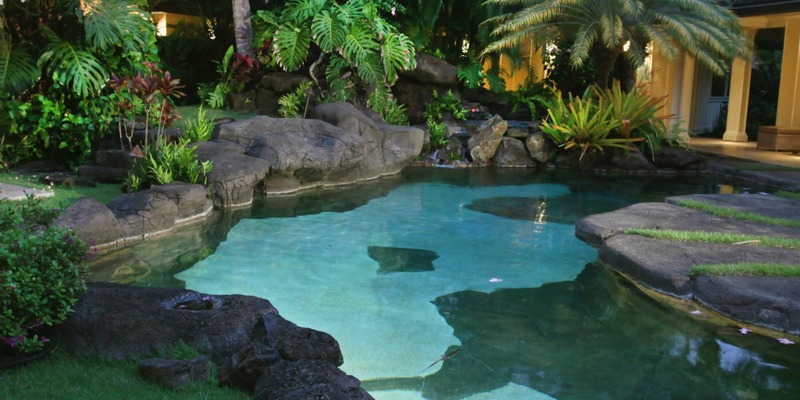 In Kailua Beach you’ll discover an exclusive luxury villa at the Paradise Point Estates. 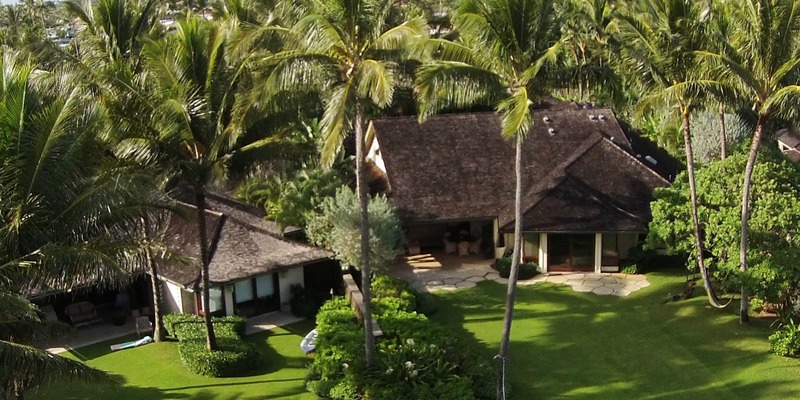 This Plantation Estate in Oahu, Hawaii is a seaside retreat you’ll always go back to. From the tropical setting, modern conveniences and its utmost security you are sure to have the ultimate holiday experience on the island. Fact is it’s otherwise called the Winter White House because the Obama family often spends their holidays at the impressive villa. Setting foot at the Great Room at Paradise Point Estates you understand why it was known as such. Expansive with high ceilings and sophisticated details, the living space is open with natural stone tiles, etched windows as well as elegant furnishings. 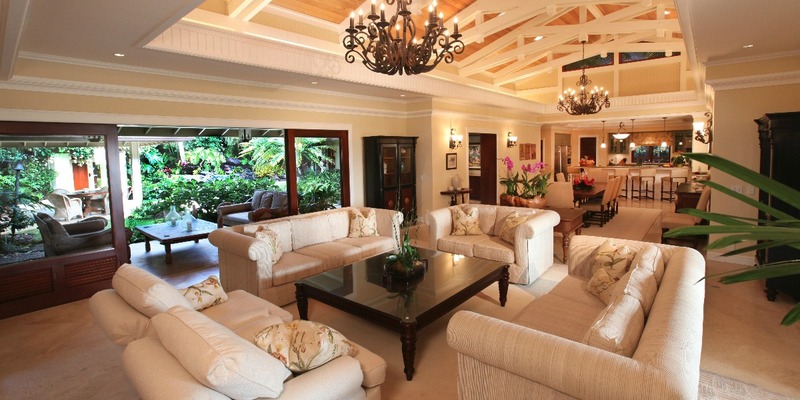 Accent pieces and works of art are displayed at every corner of this island luxury villa. The contemporary design of the splendid beach residence blends perfectly with the tropical Hawaiian atmosphere. The dining area is still part of the Great Room and is situated next to the gourmet kitchen. 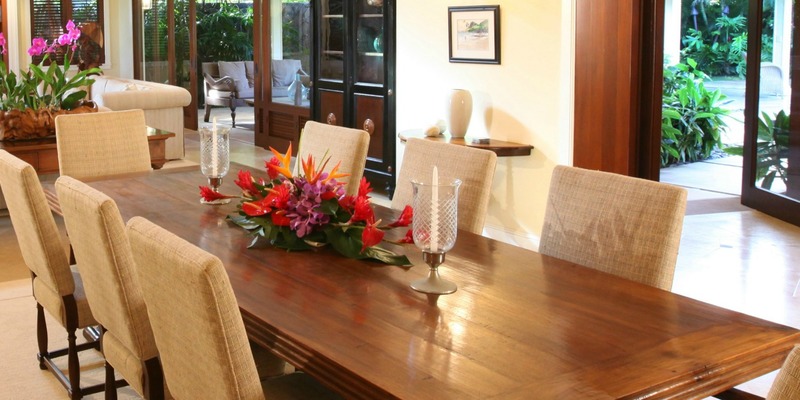 The dining table and chairs are elegant with tropical flowers and candles as the centerpiece. The glass doors allow you to catch a glimpse of the courtyard with a beautifully landscaped garden. Want to know the best part? Having meals with loved ones in this part of the luxury villa you are treated to a scenic outside view. 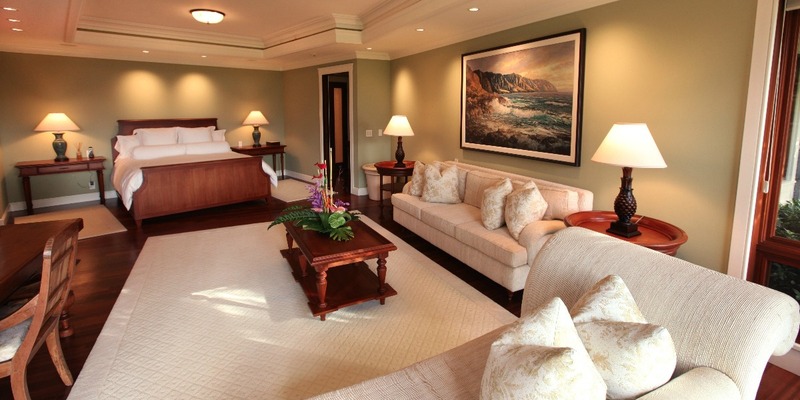 Paradise Point Estates includes an elegant master suite featuring a king size bed plus a view of Kailua Bay. You’ll find that this living space also includes a chaise lounge, a sofa, and a writing desk. This opulent residence has five bedrooms all of which with an en suite bathroom and four with a walk-in closet. Remarkable works of art by local artists serve as accent pieces in each of the bedrooms. 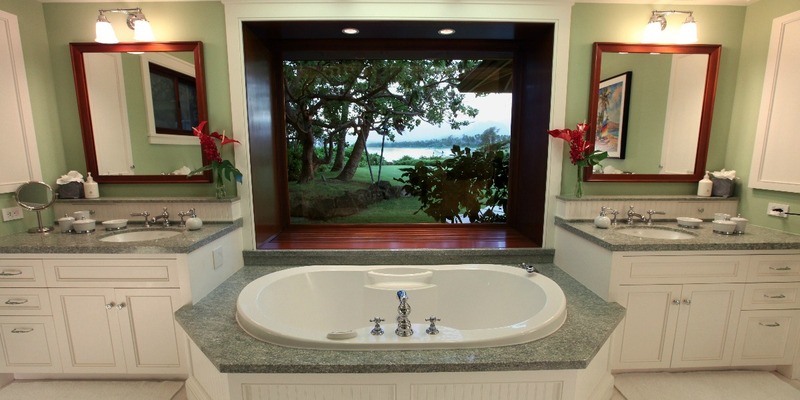 This is without a doubt an extravagant bath that offers ultimate relaxation while setting eyes on the coast of Hawaii at Kailua Beach. The master suite’s therapeutic spa tub is a delight after a day out exploring the island. By the way a steam shower is also within reach if you choose to have one. There is no need to rush while bathing in luxury at the Paradise Point Estates. And you are going to love this. 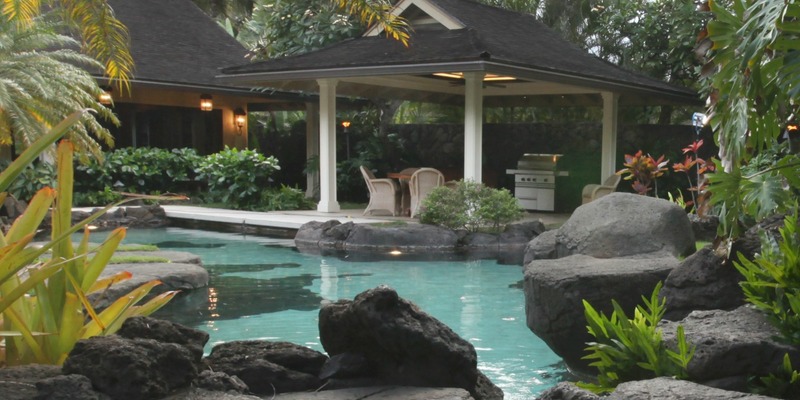 The Paradise Point Estates center courtyard has a tropical setting with a lush garden that includes a heated and secluded lagoon-style pool along with a pool pavilion, a waterfall as well as a relaxing island spa. The garden lanai has comfortable cushioned sitting areas where you can take it easy and enjoy the surrounding view. There is also a gas grill plus a pool bar with ice maker. 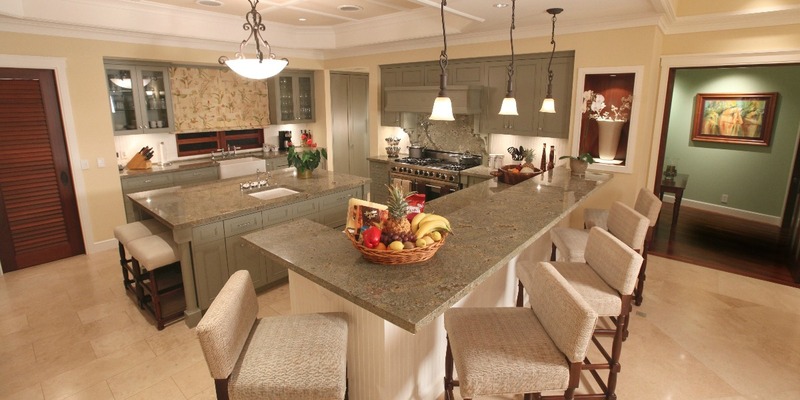 The state of the art gourmet kitchen at Paradise Point Estates is well-equipped. It’s up to you if you want to prepare home cooked meals with family and friends. If you prefer to have a personal chef create culinary treats, it can also be arranged. This kitchen features a sunken ceramic sink, a Viking Range with a double oven, a Sub-Zero refrigerator and a Sub-Zero freezer, wine refrigerator plus a microwave and expresso/cappuccino machine. Think of it this way. This tropical paradise will be your home on your next visit to this breathtaking destination in Oahu. Every day there is something to look forward to from sunrise to sunsets to experiencing ultimate adventures and indulgences. You just need to sit and relax, enjoy island living. There is nothing to worry about while on vacation at Paradise Point Estates. It is all about beachfront luxury in this remarkable abode in Hawaii.